Akashic Records are the "Book of Life" as it contains the history of every soul and is a compilation of every, thought, word and deed that has occurred in space and time since the dawn of creation . These Records are not physical in nature like books or scrolls but are an Energetic vibration which translates into images, forms, symbols, imagery that the Subconscious mind can understand via dreams, reverie, intuition and esoteric exercise. The Records contain an ever evolving blueprint of soul's individuality that repeatedly manifests in every aspect of an individual's life. The Records continually attempt to guide, educate and transform everyone to eventually become the very best they can be. What is the purpose of the Records...every Soul is creative in nature and wants to find out ' Who am I' and in this journey of ' Choices' it learns to transform knowledge into wisdom. How through a set of meditations and Prayers we'll be accessing our Records with the help of the Master, Teachers and Loved Ones who'll assist us in our learnings. How to feel the Energy of the Records ...an open Heart chakra brings us in touch with the vibration of Akashic Records. We'll learn how to ask the right questions . ..it's important to be in the 'how, what, why ' sphere and not ' when' or ' should or would' zone as Akashic Records is all about finding possibilities and letting go our fears, jealousies , resentments and anxieties . How to read the Records of your partners, his/her particular problem, how it began , it's circumstances , how does it help him to become aware of his essential goodness by going through experiences. We learn to make note of the guidance received and also how we can look for some unique gifts or talents or abilities from some lifetime. How the Akashic Records will equip us in understanding the ancestral baggage which we may be carrying in the form of a curse or blessing. 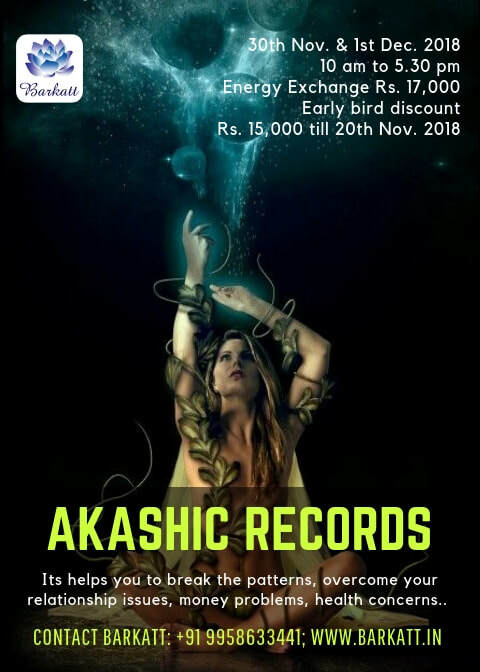 Reading Akashic Record will help us to release our fears, phobias and anxieties and also find reasons for prolonged illnesses or any other issue by giving us verbal guidance through our present pattern and challenges. After the Training, you can be a Professional Akashik Record Reader. Aalkkah is a certified Facilitator of various healing modalities like Past Life Regression, Akashic Records, SwitchWords, Theta Healing, Pranic Healing, Shamansim, Chakra Healing, Tarot, Angel Cards, Merkaba, Auto Writing, Magnified Healing, Ayurveda, Food Nutrition, Pranayam, Yoga, EFT, Acupressure, Access Consciousness and Bach Flower Remedies & more.